Help HQ Validate Data with ... Zapper! 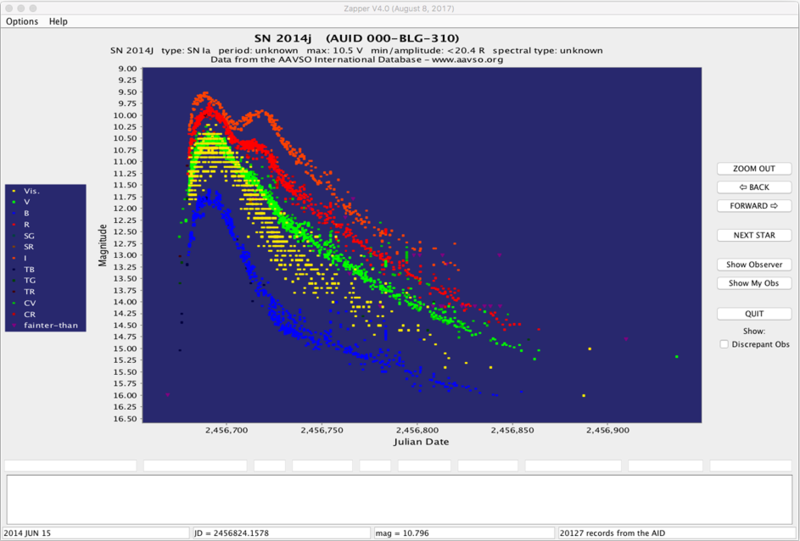 Are you interested in helping HQ make sure that our variable star data remain the best in the world? You can help us to achieve that goal by using Zapper. Zapper is a Java, multi-platform program that will enable our members and observers to help us in the massive, unending task of making sure our data are of the highest quality. You can also run Zapper from your local machine by downloading this file: Zapper.zip. Unzip this and see the readme file for instructions. 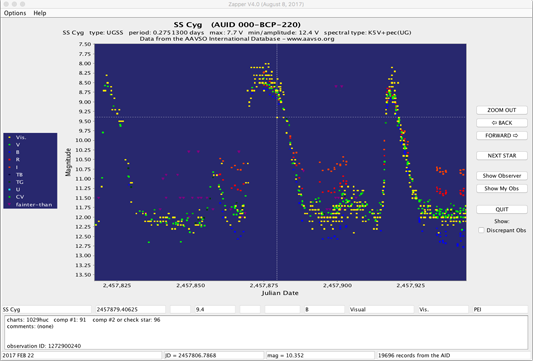 Zapper is an easy-to-use tool designed to enable AAVSO members to help the HQ staff with data validation. Zapper is run via Java Web Start so that it will always be up-to-date. The first time you download Zapper, a file called zapper.jnlp will be placed on your desktop (or your browser's default download location). Next time you use Zapper, you can begin the program by double-clicking the zapper.jnlp file. 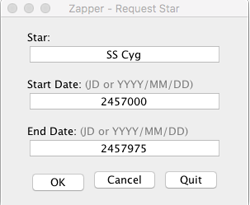 It will then check to see if you have the most recent version of Zapper and if not, the program will automatically download the newer version from AAVSO HQ so you never have to worry about having an old version, should any changes be made to the program. Simply click on the link above and Java Web Start will download the program onto your computer. Download Zapper and Data Evaluation Documentation to read and reference offline. Users can call up data on any star in the AAVSO International Database (AID) by name, designation, or AAVSO Unique ID (AUID). Any JD range or calendar date using the YYYY/MM/DD format can be specified. A warning that loading the data might take a bit longer will be issued if more than 30,000 observations are requested. Users will have the option to plot another star or reduce the date range if they want. Left-clicking on a point will display all pertinent information on it below the graph. Right-clicking (or CNTRL-Left-clicking on Mac iBooks) on a discrepant point will send information on the data point to AAVSO Headquarters. You will also be given the opportunity to add a comment which will be associated with this point. This is how discrepant observations will be flagged for HQ staff to inspect. Zooming can be done by clicking and dragging the mouse to create a zoom box. Zoom Out backs out of any zooms you might have done, step-by-step. Back and Forward will allow you to pan backward or forward in time along the JD axis. You can also use the left and right arrow keys. Show Observer will allow you to highlight the observations made by the observer you select. Hide Observer will undo this. Show My Obs will highlight observations made by you. Hide My Obs will undo this. Clicking the "Show: Discrepant Obs" checkbox will highlight with red crosses all observations previously determined to be discrepant by HQ Staff as well as observations you mark. 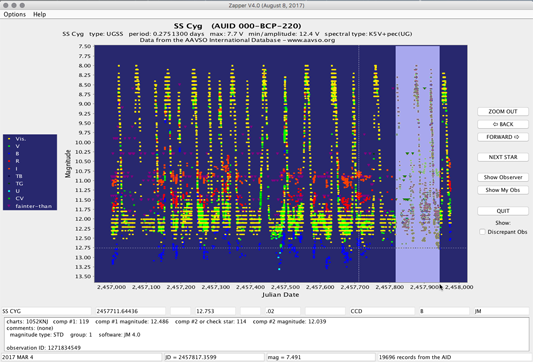 The Options menu item in the top left corner allows you to customize the color scheme of the plot, and the size of the dots. Your selected settings will be saved to a file called zapperDefault.ini in your Home directory. There are also options available for saving or printing the plot. A file called ZapperLog.ini will also appear in your Home directory. It is hoped that this file will come in handy for troubleshooting purposes if I wish to try to recreate a bug. Please feel free to contact the AAVSO (aavso (at) aavso.org) if you have any questions, comments or problems. Your feedback and help is greatly appreciated! Download Java from Oracle - Directs you to the Oracle website where you may download the Java SE (standard edition) depending on your operating system platform. Most current operating systems come with Java installed so most people will NOT need to download Java. However, if you have an old system that does not have Java you will need to download the Java Runtime Environment (JRE) in order to run Java Web Start, which is the application that will launch Zapper on your computer. Zapper requires Java version 1.7 or later to run.